First, a tease: in his recent interviews, KSR has made no secret that he is hard at work on his next novel! -- and that it will involve the colonization of the moon and China's role in our larger human civilisation. What does KSR's writing quarters look like? Since around the time of writing the Science in the Capital trilogy and Galileo's Dream, he has been writing exclusively outdoors, from his back yard, winter or summer, witnessing the passing of the seasons. The Sacramento Bee provides us a short insight in the writer's own home. KSR's latest novel, New York 2140, is a novel both full of KSR's usual themes and a novel like no other in his previous work. It is a work of everyday life and utopian hope in the midst of what many would consider a dystopian future, a work of climate-fiction and finance-fiction. Given the current state of the world and the discussion around climate change and the economic system, it feels very topical. Here’s the dilemma. Capitalism is the system we have agreed to live by. Its rules, while being legal and not involving anyone being evil or cheating, are nevertheless destroying the world. So we need to change the rules. It’s important what story you tell about the future. Stories that say the future can be better because people are smart, because they want democracy, because, ultimately, people rule and banks don’t, can be self-fulfilling. They give people actions to help break the story that says they are screwed because international finance is way more powerful. Most of my novels, I think, are actually fun because I’m doing realism in a way the world needs. As for anyone picking up the mantle, there’s a group of young writers who call themselves solarpunk, and what they’re trying is all about adaptation. The way it came about is I did want to write a book about global finances that exist now, and how we might seize it, take it over and make it work for people. [...] The book is making the case that climate change is basically a financial disaster, or has been caused by bad economics rather than bad technology or pure number of people. [...] We are in an economic-slash-political system that is actually causing the problem, and so it's very hard to make it into a solution for the problem. And that's the story I wanted to tell. 120 years on, materials science has given them what they call a kind of diamond spray, and also graphenated composites. Right now, these are both more ideas than realities, but they're not far off. Both of those would be incredibly useful materials to have if you were coping with a drowned New York. The interesting thing is that since I've finished the book, people have sent me articles that apparently Singapore is contemplating doing this very thing [floating islands that are tethered], because Singapore is another city that is at sea level, and they have a problem. Also, KSR's event with fantasy author George R.R. Martin at UC San Diego to support the Clarion Science Fiction Writers Workshop got plenty of coverage! See reports by the San Diego Union Tribune, La Jolla Light and the UCSD Guardian (see also our previous update for more on that). Fun bit frpm La Jolla Light: Stan "was also sporting his brown hiking shoes that still had a little mud on them from The Sierras"! The solar system-wide interplanetary Grand Tour of Johannes Wright's Orchestra of The Memory of Whiteness: A Scientific Romance, an early and wild KSR novel (1985), got a new paperback edition by Tor. 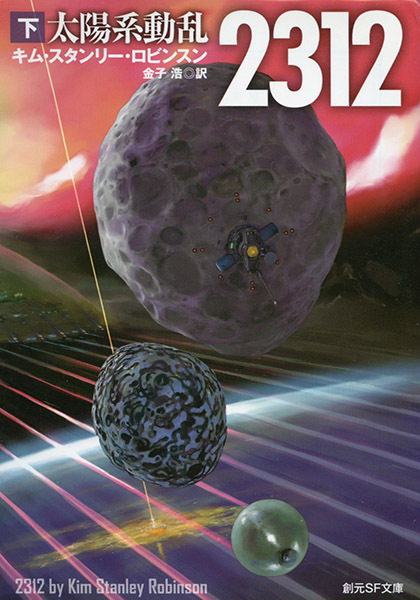 Featuring a cover with a space and Saturn montage, and praise by Greg Bear. 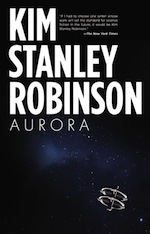 Aurora has been translated in German (Heyne) and Spanish (Minotauro). The German translation of New York 2140 is scheduled for January 2018. Italians finally got a translation of Green Mars and, since March, of Blue Mars as well, along with a reedition of Red Mars (Fanucci Editore). 20 years after the first translation of Red Mars, the trilogy is complete! 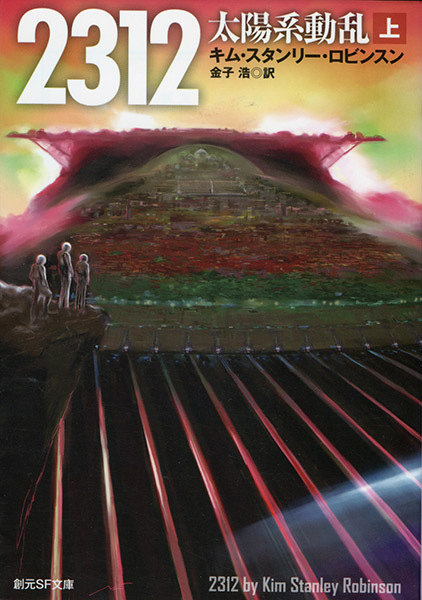 2312 has been translated in Japanese (Tokyo Sogensha, in two volumes, with some crazy visuals, as usual! ), in Chinese (Congqing Publishing Group; see also KSR's visit to Beijing last year), and also in Turkish! On that last one, see an article written by translator M. Ihsan Tatari on the tough 8-month work of translating 2312 into Turkish. Top illustration by Vicent Mahé for a New Yorker article on New York 2140.